Here is our Stonehenge photograph combined with an identification of the sarsens that are viewed, looking from the Heelstone on the Avenue at the northeast toward the southwest along the main axis of Stonehenge. Do you see the two tumps in the distance, which look quite like astronomical sights? 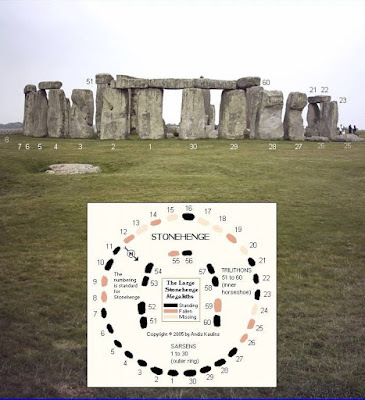 See also Stonehenge at the Megalithic Wiki and Megaliths.net and the Stonehenge Barrows. This Archaeology Travel Photos Blog was created to call attention to the Archaeology Travel Photos group at Flickr, which, [as of May, 2012, has ca. 3000 members who have posted ca. 35000 photographs].